So it has been a while since my previous post on some data taken from the UNHCR database. This post we’ll bring it back to the topic of infectious diseases (check out my other posts on the SIR model and MRSA typing). For this post, as similar to previous ones, I give a guide through the process I took to organize the data, a nifty function I created to search the documentation and a visualization of the data using ggplot2. Tuberculosis (TB) is a nasty disease caused by the bacterium Mycobacterium tuberculosis. It was first described by Hippocrates and has a history concurrent with human civilization. Individuals infected with TB usually do not develop active disease but if they develop active TB, they can on average infect 8-10 people. Most of the time when we hear of TB, we think of the infection within the lungs, but I learned during my time volunteering in a medical clinic in Peru that TB can manifest in other sites of the body (extra-pulmonary TB). This bacterium has infected roughly a third of the world’s population and is a top 10 cause of death around the globe. TB and HIV co-infection, where there is a disproportionate mortality rate by TB with HIV infected individuals. HIV infects CD4+ T-cells, which are essential for an appropriate immune response to combat TB. This relationship has been reported in patients. Multi-drug resistant TB (MDR-TB) is a growing public health concern that threatens the control of TB infection throughout the world. There have been reports of extensive-drug resistant TB (XDR-TB) which is resistant to the standard treatment of isoniazid and rifampin alongside any fluoroquinolone and at least one secondary-treatment drug. Fewer treatment options put patients under rigorous and strenuous regimens and present a risk of transmission to others. The data I used for this post is taken from the World Health Organization from this link to the TB data. Specifically I used the data dictionary and TB burden estimates. When you click these links, they generate a comma-delimited file (.csv) and date-stamp the file. I downloaded these files back in February 2016. Just remember where you save these in your local directory so you can read them into R for the near future. The code I use for my posts can be found on my GitHub account, open for free use and adaptation. I’m always open to comments and suggestions on how to improve my code or even a completely different method to reach the same goal. Optimization of R programming is something I am working towards bit by bit. After setting up your working directory, read your comma-delimited files using the read.csv() function. The WHO files are conveniently formatted so there is no need for elaborate arguments for headers, field separators or assigning missing values. I’m only going to highlight a couple things in the code above. I converted the definitions found in the documentation file because the original data type was a factor. This was a problem with the print output because it would show all the unnecessary information on the number of factors and values of the factors I had no interest in. Secondly I ended up using a repeat in my if statement to prompt the user if they incorrectly typed in a variable name in the console. This link provides some helpful information on the repeat loop. Other then that, I used regular expression to specify the search to match what was actually in the documentation file. After that, I used the mapvalues function from the plyr package to change the levels in the country variable. I used this because the basic functions in R require me to specify all the levels in the factor and using 219 country names seemed tedious. Quite simply, I just listed the old names I wanted to change and created a respective character vector of the the new country names. I threw in some random subsetting into the code to pull out values for specific questions (ie. what was the estimated prevalence per 100,000 people of TB in Peru during 2014). You can see it in the actual code in the GitHub repository. I was interested in what estimated rates of TB were by WHO region, so I ran a simple loop to assign new variable names to each region (this is not the best practice IMO but it does the trick). Now we set up the themes we want to use for ggplot2. I set the year scale for the legends, customized the text on the axes and assigned dark_t to be a dark, black-grey background and light_t as a simple, white-grey background theme. For the next plots, I’ll only be focusing on the WHO Region of Africa. Two notes on the code below for the plots: 1) I used the forcats package to reverse the order of the countries on the y-axis. This package is useful when using ggplot2 for categorical data. 2) For the legend scales, I used the comma() function in the scales package to include the comma’s for every thousand. 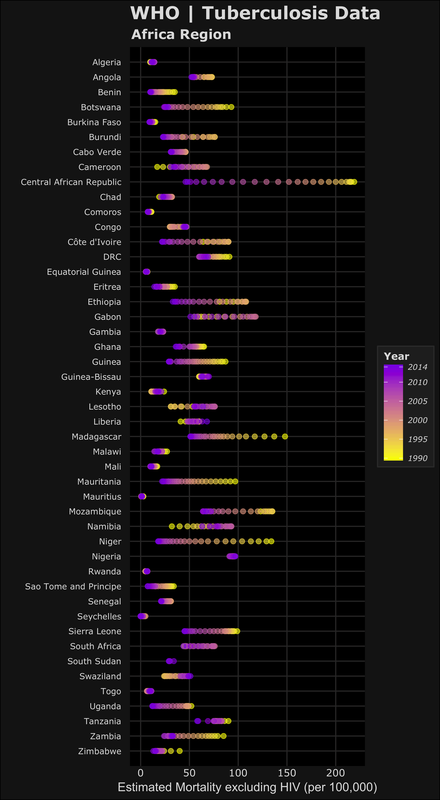 The following code displays the estimated prevalence, mortality and incidence (per 100,000 people) for cases from each country in the WHO Africa Region. In the plots, the color yellow refers to a year closer to 1990 where purple is more recent towards 2014. Based on this we can see the relative changes over time on the estimated TB prevalence, incidence and mortality. Let’s focus on the prevalence and incidence plots – we can see most of the countries have lower estimated TB prevalences over time. The most drastic decreases can be seen in Central African Republic and Niger. We can also see that Lesotho, South Africa and Swaziland have increased estimated TB prevalence during the 1990-2014 time period. Namibia is an interesting one because it seems that the estimated TB prevalence increased then decreased roughly half way. To accurately visualize this trend in Namibia, we would need a choose a different method to better visualize this (a simple line plot). Remember these plots are just a simple qualitative way to compare trends but doesn’t capture the full picture. I’ve learned that your method of visualizing data depends on which narrative of the data you want to highlight. 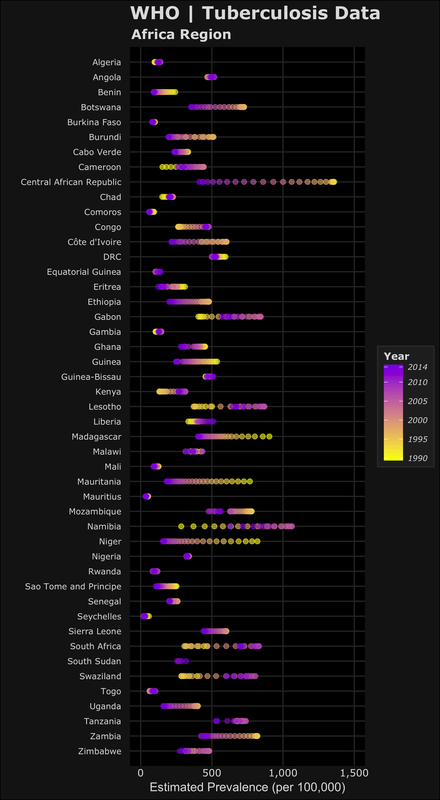 These graphics could be used to see which countries have had the largest changes over time or as an example, identify countries who have improved (or failed) their national TB control, using estimated TB incidence as a proxy. Are TB control or prevention systems working in these countries? Based on allocated resources or programs, are the changes in line with the goals to reduce the global burden of TB. You can tinker with the code to select which countries or regions you want to compare. 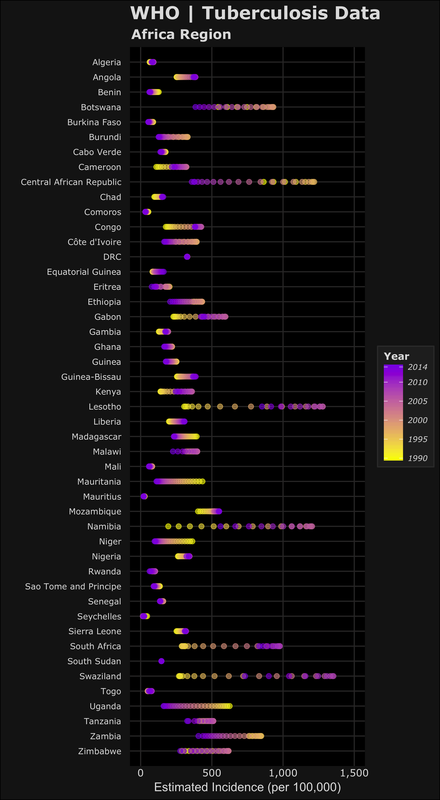 I only displayed the plots for the WHO Africa Region but the other regions also looked interesting. You can adapt this code for the other WHO regions to see what the trends look like. Closing thoughts: I hope this post was informative and you learned something about TB around the world. Despite this disease being preventable and curable, it remains a real threat for many people around the world. There are groups fighting TB around the world, just one close to Boston is the endTB partnership. Check out their website and see the groups (PIH, MSF) involved in the work of combating MDR-TB. As always I’m open to comments and suggestions on improving my code and graphics. If anyone has questions related to the code – send me a message, I’ll be more than happy to help. I’ve learned so much from online resources and communities like StackOverflow and would always want to help those new to using R.
To leave a comment for the author, please follow the link and comment on their blog: R – Incidental Ideas.